Barkzilla: A Savvy NYC Dog Blog: My oh my, pizza pie! Pizza is the latest craze when it comes to eating-out in NYC, so why should your dog miss out? 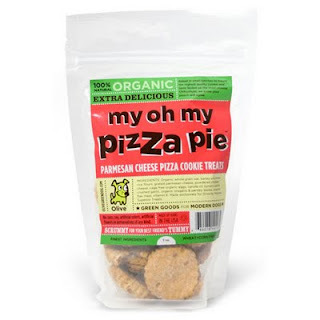 Needless to say, we aren't so keen on sharing our pizza dinner with Paddington both for health and personal reasons (pizza= yummy in Barkzilla girl's tummy), lucky for us we have some of Olive Dog's tasty "My Oh My Pizza Pie" dog cookies on hand for those rare takeout nights. These Parmesan cheese pizza flavored treats smell just like the real thing. 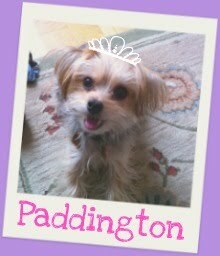 Even Paddington the Picky didn't turn her nose up when these treats hit her dish! Made in small batches to ensure top quality, these snacks feature notes of oregano, Parmesan and cheddar. Cooked up using only the freshest, most natural organic ingredients (Olive dog even uses cage-free organic eggs! ), these delicious aromatic tasties also contain NO wheat, corn, soy, artificial flavors or colors, or preservatives. Low in saturated fat, we wish our pizza was just as good for us. A little on the larger size for smaller dogs (think about the size of an Oreo), break these treats down for more manageable snacks. Pick up a 7 oz. bag from Olive Dog's website for $8.25, and don't forget to check out their other environment & pet friendly products!